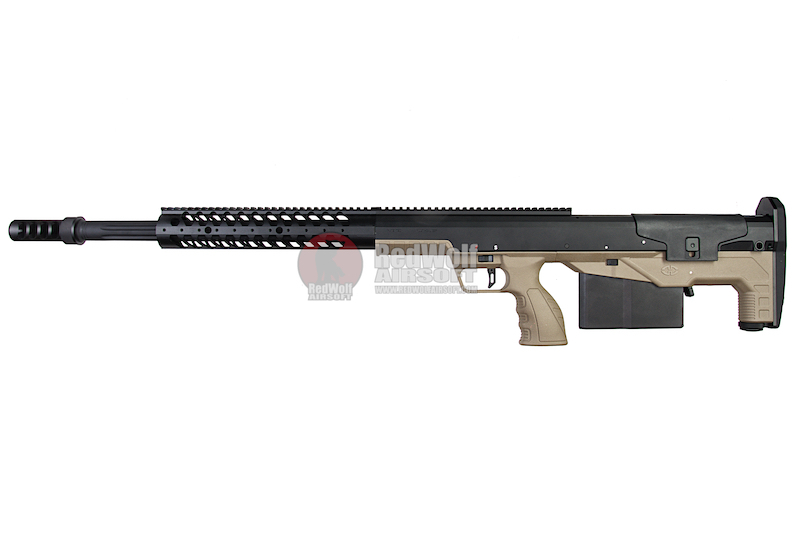 The Silverback HTI is a fully licensed version of this rifle. Not only does it faithfully replicate it in terms of size, fit, and finish, it also takes some of the the "big bore" designs and translates it to this airsoft gun. The gun is a redesign to fit with the big bore design as it is not simply a "SRS system drop in" but its redesigned to not only make the gun shoot and feel like a great sniper rifle but also it makes this probably the first practical 50 cal. airsoft sniper rifle to use in games. The gun features twice the air volume of a VSR-10 (35 cubic centimeters) which translates into higher muzzle velocity for your BB. In countries where the FPS is regulated to be lower, that means you can get much more consistent shots off with a much more stable fly of the BB over longer distances. Finally the HTI does share some similarities with the SRS. The hop up is the same and is compatible on both guns. It uses he same quick change barrel system, and its operation feels the same.